Three more tenors, anyone? 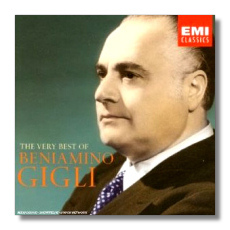 EMI Classics has been releasing a worthwhile "Very Best Of" series highlighting vintage vocalists from its back catalogue, and the sampling reviewed here certainly will give Pavarotti, Domingo, and Carreras a run for the money. Most if not all of these selections have been released on CD before. There's nothing new here. Still, the price is right – two very generously filled discs are going for the price of one. There are no texts and translations, and the recording information (dates, venues, etc.) is sketchy. On the other hand, a new essay by Tony Locantro has been commissioned for each of these releases, and there are a few photos, so these inexpensive "twofers" don't feel too cheap. All three releases mix excerpts from complete operatic recordings with studio recital work. All three tenors did the bulk of their work on disc for EMI, so it has been possible for the label to select highly representative samplings of their work. The earliest aria on the Gigli compilation (Faust's "Salut demeure," sung in Italian) is from 1931; the latest is the weird 1949 version of "Nessun dorma," where the opera's final chorus is tacked on. This already was quite late in Gigli's career – he was nearly 60 – yet he still sounds like a victor. (And he kept on recording for several more years.) This compilation sticks largely to solo material, but the voices of Maria Caniglia and the young Giulietta Simionato make brief appearances. And although I like the selections, the sequencing is a little strange. Rather than trying to create stylistic continuity throughout, the reissue producer seems to have thrown some of the selections in a hat and picked them out a random. For example, "Una furtiva lagrima" from L'elisir d'amore is the third selection on Disc One, but "Quanto è bella" from the same opera is the penultimate track on Disc Two. Most of the digital remasterings are recent, and some of the selections sound startlingly good, almost aggressively so, for their venerable age. 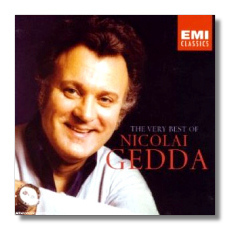 Nicolai Gedda (still very much alive, I hope) was born 35 years after Gigli. He is the son of a Russian father and a Swedish mother, and a natural polyglot. (How unlike Gigli, who was quite content to sing even French operas in his native Italian.) Gedda had the reputation for being one of the most intellectual tenors of his era, and his voice, while not notably powerful, was meltingly beautiful, and he could make his tone smile. (A great example of this is at the end of "Che gelida manina" – not included here, unfortunately – when he encourages Mimi, "Vi piaccia dir.") He brought something fresh to everything he tried – and his repertoire varied from Russian art song to Mozart to the French romantic heroes to (infrequently) Wagner. A few of these recordings are monaural. Gedda recorded Boris Godunov in the early 1950s, and there was an excellent recital LP with Alceo Galliera a little bit later. Most are stereo, however, and there are excerpts from many of Gedda's later complete recordings, including Hoffmann, Carmen, and L'elisir. Again, there is an emphasis on solo work, but the Boris scene includes the formidable Eugene Zareska's Marina, and EMI Classics has included the popular duet from The Pearl Fishers in which Gedda is rousingly joined by Ernest Blanc. This time around, the sequencing is more sensible; French repertoire is succeeded by Italian, then German, then Russian, with songs and three operetta arias bringing up the rear. The remasterings are good, although of few Gedda's high notes are distorted. 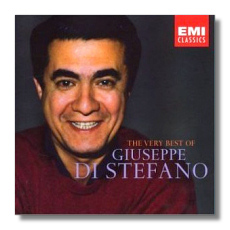 Even more so than Gigli, Sicilian tenor Giuseppe di Stefano had a voice that was suffused with the brightness of the Italian sun. Today he has remembered mostly for being Maria Callas's partner on many of her complete operatic recordings, but di Stefano unquestionably deserves to be appreciated on his own. Several of the selections here are taken from the tenor's excellent series of sides, recorded in 1947, with conductor Alberto Erede. This was just a year after his official debut, and Di Stefano never sang with more freshness and warmth than this. Another six selections come from 1959 and a session with Antonino Votto. This was the beginning of the end for the tenor, whose lifelong respiratory difficulties were getting the better of him. In between, we are offered excerpts from many of his recordings with Callas, although the diva appears only in duets from Manon Lescaut and Un ballo in maschera. Late in his career, di Stefano made a beautiful recital LP for Decca (his "Pourquoi me reveiller?" from the outing is unbeatable), and that CD should in every tenor-fancier's collection. Apart from that, however, the present release gives the listener an excellent overview of di Stefano's career, and what he was capable of. Again, most of the digital remasterings are recent, and the sound, albeit monaural, is consistently better than on the Gigli and Gedda sets.